Francesco Bagnaia (Kalex) claimed the 2018 FIM Moto2 World Championship title with a race to spare, claiming his twelfth podium finish of an incredibly consistent season at the eighteenth round of nineteen in Malaysia, having already posted eight wins. ‘Pecco’ is no stranger to making history in his short career, having famously scored the first win for Indian factory Mahindra in the Moto3 class in 2016 at the TT Circuit Assen. 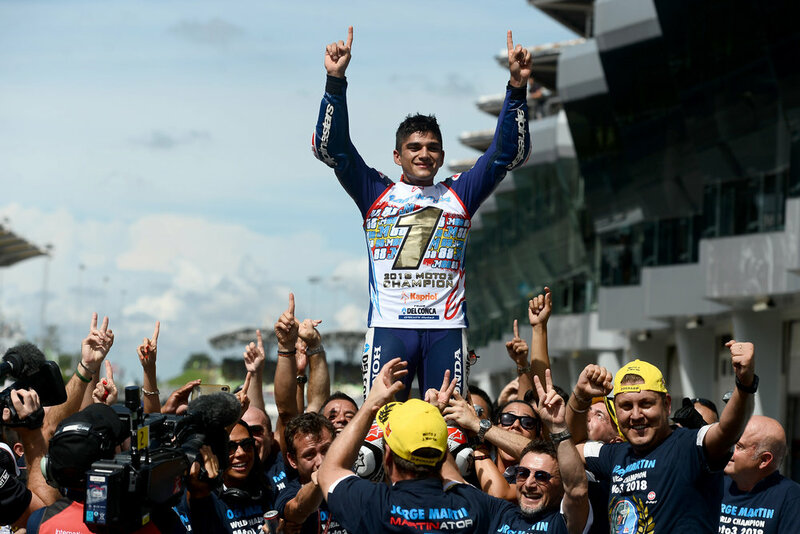 Another win at Sepang put him fourth in the overall standings that year and marked the 21-year-old out as a man to watch when he made the step up to Moto2 in 2017. Bagnaia’s first Moto2 podium came at Jerez in round four and was followed by three more as he finished as the Rookie of the Year in fifth overall. Back with Sky Racing Team VR46 for 2018, the Italian started the season on the top step with a first Moto2 win in Qatar and followed up in Texas and Le Mans to make it three from the opening five races. Miguel Oliveira’s (KTM) victory at Mugello brought him to within a single point of Bagnaia and the pair traded wins at Assen, Brno and Austria as the championship battle turned into a two-rider affair. 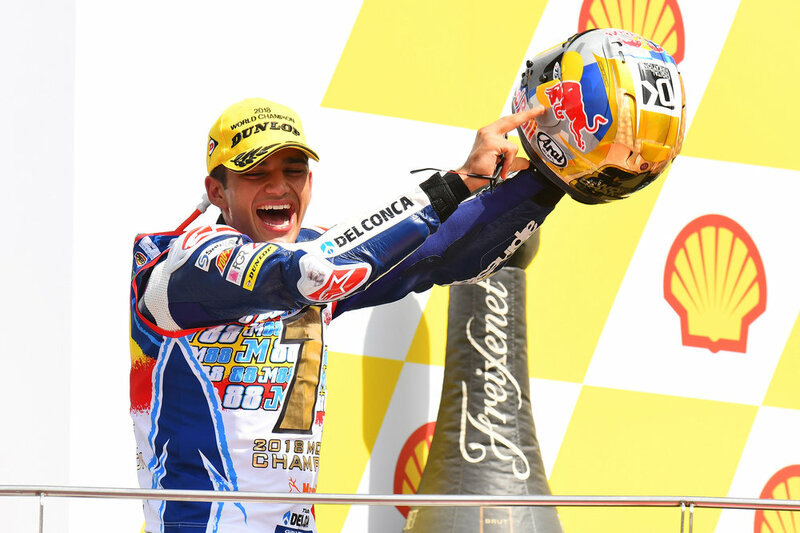 However, further wins at Misano, Buriram and Motegi moved Pecco clear, as he picked up points in every single race. After missing his first chance to take the title at Phillip Island, third place in Malaysia was enough to make Bagnaia the second Italian rider to win the FIM Moto2 World Championship, following on from Franco Morbidelli last year. 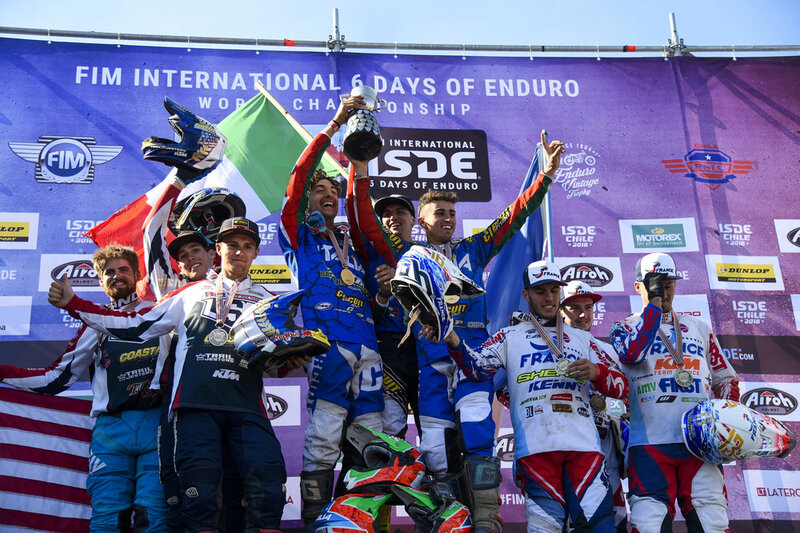 Toby Price finally added an FIM gold medal to his impressive list of off-road honours in 2018, claiming the FIM Cross Country Rallies World Championship after overhauling 2016 and 2017 champion Pablo Quintanilla (Husqvarna) in a thrilling final round in Morocco. Price had scored several stage wins throughout 2018 but went into the Rally du Maroc looking for his first overall victory of the campaign, knowing that’s what it would probably take to overturn Quintanilla’s eight-point advantage. The season had started with mixed fortunes for the Australian, who won the opening test at the first round in Abu Dhabi only to crash on the second stage, costing him over half an hour while he made repairs. 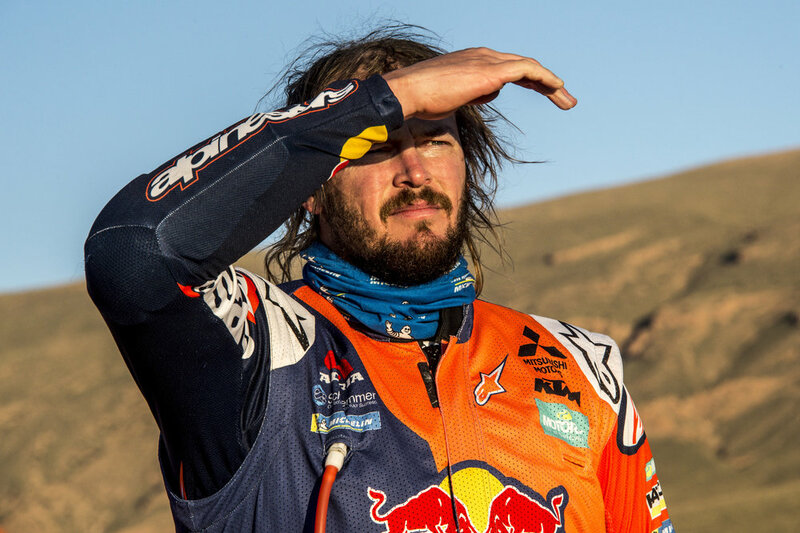 The next day saw Price wait with an injured rider until medical assistance could arrive and even though he was given the lost time back he ended the rally seventh, whilst the Chilean opened his title defence with a commanding victory. 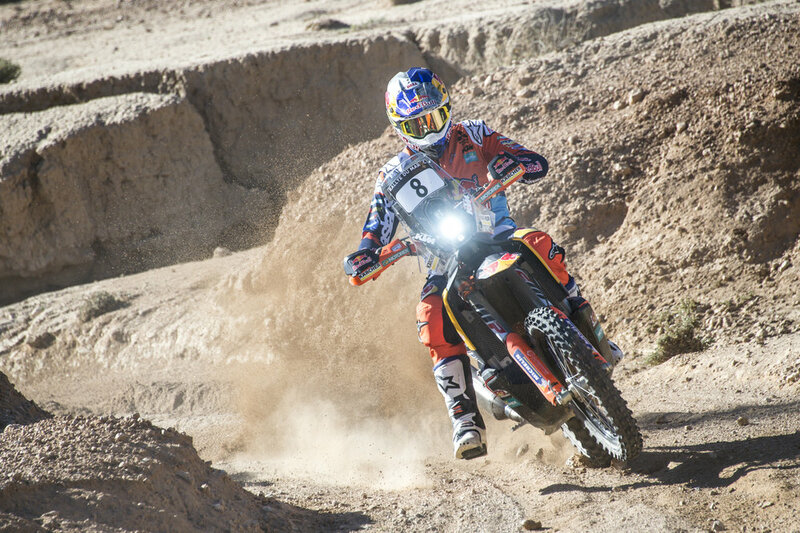 With the Qatar Cross-Country Rally not supported by the factory teams, Polish youngster Maciej Giemza (KTM) claimed the win and the championship lead and after success for 2018 runner-up Kevin Benavides (Honda) at the Atacama Rally in Chile and Paulo Gonçalves (Honda) in Argentina - with Price taking the runner-up spot in both – the chase for the title going into Morocco was wide open. After winning the prologue and the Marathon stage, second place on the final test was enough to secure the rally victory and the title for Price, with Quintanilla unable to do better than fourth overall. Price’s triumph in Morocco came four years to the day of his maiden international rally at the same event in 2014. Tai Woffinden became the first British rider ever to be crowned as a three-time FIM Speedway World Champion and secure his status as a true legend of the sport at the final round of the 2018 season in Toruń, Poland. After another strong and consistent campaign, ‘Woofy’ headed into a title showdown with Bartosz Zmarzlik in front of 20,000 passionate fans at the Pole’s home round in Toruń needing just twelve points to claim the title. However, Zmarzlik produced an inspired performance to take four straight heat victories and keep the pressure on the British rider, who looked like he might have cracked in heat 11 when he crashed and suffered a suspected broken metacarpal in his foot. Woffinden rode through the pain barrier and after a victory in heat 20 he took second place in the semi-final to wrap up the championship. The gritty Brit then rode with the shackles off in the final to win his second Grand Prix in a row and top the podium, inflicting Artem Laguta’s sole loss of a sensational night. The championship runner-up spot for Zmarzlik, upgrading the bronze medal he won in 2016 to silver, was just reward for a strong season that included a famous win at Woffinden’s home round in Cardiff, whilst Lindgren’s first ever World Championship medal was the ideal way to bounce back after his 2017 season was ended by a spinal injury. Woffinden, who also took gold in 2013 and 2015, surpasses fellow countrymen Freddie Williams and Peter Craven on two world titles and has already set his sights on matching Ivan Mauger and Tony Rickardsson’s record haul of six. His more immediate target for next season, though, is to retain the title for the first time and become only the third rider to do so in the SGP era since 1995.